The Crustacea are a subphylum of arthropods with 50,000 described species. They are part of the phylum Arthropoda. Crustaceans include crabs, lobsters, crayfish, shrimp, krill and barnacles. They are relatives of insects. If the Arthropods are regarded as a superphylum, then the insects and crustaces would be phyla. (see List of animal phyla). The group has an extensive fossil record, reaching back to the Cambrian. Crustaceans are mobile, but some become sessile after their larval stage. Barnacles become attached to rocks on the sea shore. Some are parasitic, like fish lice, and tongue worms. Crustacea usually have separate sexes, and the eggs hatch into larvae. 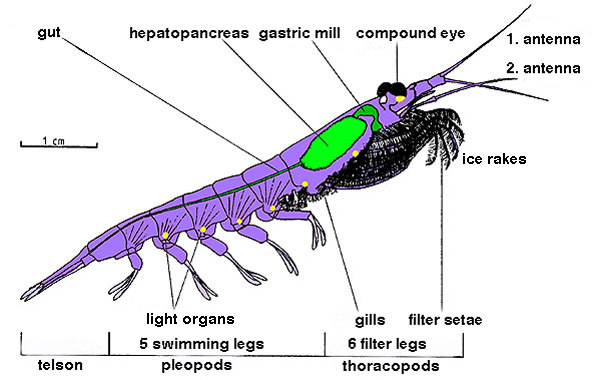 Crustaceans have three major body parts. They are, front to back: head, thorax, and abdomen. Generally, they have two pairs of antennae, two eyes, and three pairs of jaws on their head. Most breathe with gills, although certain land crabs have developed lungs. Lobsters and crabs have hard outer skeletons, and tend to preserve well as fossils. As adults, they moult their shells as they grow in size. Crustaceans exhibit a number of larval forms, of which the earliest and most characteristic is the nauplius. In most groups, there are further larval stages, including the zoea (pl. zoeæ or zoeas). This name was given to it when naturalists believed it to be a separate species. It follows the nauplius stage, and often has spikes on its carapace. These may assist these small organisms in maintaining directional swimming. In many decapods, due to their accelerated development, the zoea is the first larval stage. In some cases, the zoea stage is followed by the mysis stage, and in others, by the megalopa stage, depending on the crustacean group involved. Crustacea Facts for Kids. Kiddle Encyclopedia.